Picture this: You spent the day hustling at your booth for PACK EXPO International and Healthcare Packaging EXPO 2018. Now it’s time to entertain clients and dine with team members. Or maybe you walked along the show floor all day and networked with the 50,000 other attendees. Now you’re ready to experience Chicago’s food scene. But a stuffy steakhouse with a predictable menu is not on the table during #PACKEXPOInternational Try one of these hotels that offer the guaranteed lowest rates for registrants and have fresh restaurants that deliver culinary surprises. NEW to official room block! Cuisine: Upscale American. It’s all about harmonious food & drink pairings here. What to Order: For cocktails, the main stars of the show are bourbon and whiskey. Overwhelmed by the wide selection? Go for a tasting flight with three 1-oz pours and a palate cleanser. If you want to explore new tastes, opt in for the free range bison entree; it’s served with roasted broccoli and kimchi. Reservations: For parties of 12 or more, Baptiste & Bottle private and semi-private dining options are available. Cuisine: Peruvian and Argentinian street food served tapas-style. What to Order: Signature cocktails for parties of 6-8, or a cocktail that is crafted with both taste and the environment in mind. Each order of these special cocktails gives $1 to Zero Waste Chicago. Your party at Boleo Room is able to try a little bit of everything. The tapas menu has a great balance of vegetarian and meat options. Reservations: Private dining is offered and custom menus are not out of the question. Cuisine: Modern Spaniard cuisine from the Catalonian region. What to Order: Mercat a la Planxa’s menu is an assortment of appetizers, tapas, paella dishes (Spanish rice) and meat entrees. 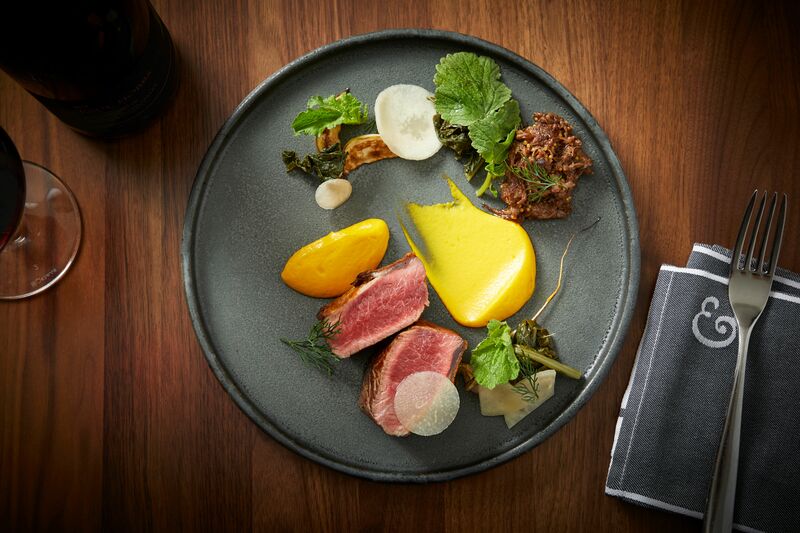 Go adventurous and give creative reign to the chef, with the Chef’s Tasting Menu at $65 per person or the Luxury Tasting Menu at $85 per person. Reservations: From a small party of 10 to a large reception of up to 130, there are private dining spaces for your company. What to Order: Both the food and drink menus combine traditional tastes with creative twists. Start off the meal with the Chef’s Dim Sum Sampler; from crab wonton to spicy beef pot stickers, this order has something for everyone. For dessert, try a traditional Cantonese dish of mango and coconut tapioca. Reservations: Reservations for the outdoor dining area are not accepted. There is a private dining room that seats up to 30 guests. Cuisine: Seasonal Italian made with local and organic ingredients. What to Order: Antipasta: Italian staples like burrata, bruschetta and meatballs. The extensive wine list of Italian and domestic selections can be served by the bottle or by the quartino (1/3 bottle). More of a beer person? Try Florentine Flights with three 6 oz pours of Chicago beers. Reservations: The Florentine’s Private Dining Room can seat 50 guests for dinner or 75 for a cocktail reception. The Chef’s Table is a semi-private choice for a party of up to 12 guests.